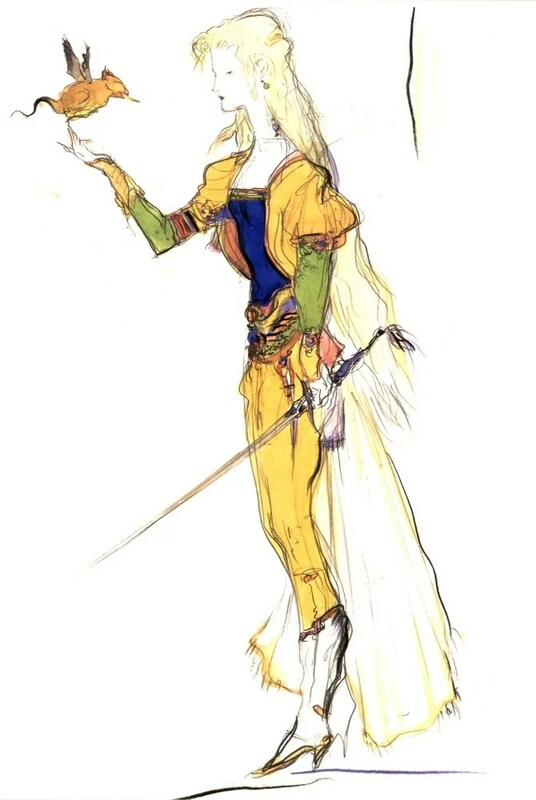 The ensemble cast of Final Fantasy VI has definitely stuck with me over the years, and I’ve written about a few of them, but I don’t think I’ve said much recently about the character who is arguably the main protagonist. I say it’s arguable because it was never intended to focus on one viewpoint character the way FF4 has Cecil, FF5 Bartz, and FF7 Cloud. 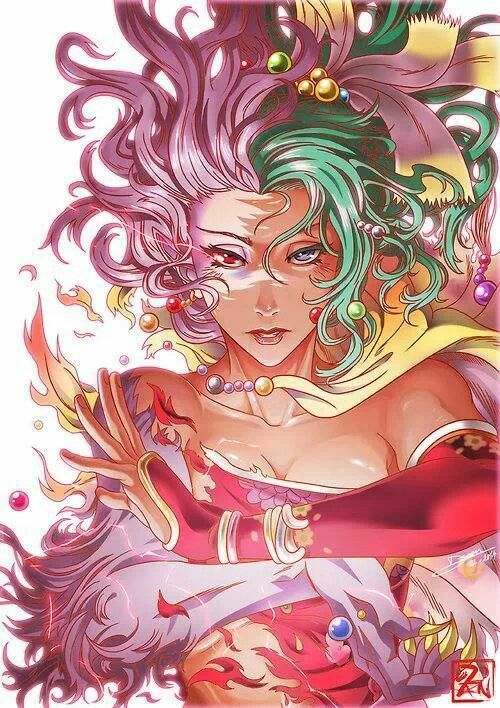 Still, Terra Branford is the first character you control (not counting the temporary Biggs and Wedge), and is quite central to the plot. Also, if you do count her as the main protagonist, she’s the first female to hold that role in the series, and that’s definitely cool. I recently read somewhere that, since FF4, pretty much every main FF title has had three playable female characters. I haven’t played beyond FF7, but it does seem to work out up through that one. FF4 has Rosa, Rydia, and Porom; FF5 Lenna, Faris, and Krile; and FF7 Tifa, Aerith, and Yuffie. FF6 fits the pattern as well, with Terra, Celes Chere, and Relm Arrowny. It also generally seems to be the case that two are adult women and one a child, but that’s a bit flexible. Rydia starts out as a child, but grows to an adult due to spending time in a place where time flows differently. And Yuffie is sixteen, which isn’t that much younger than the other two, but she’s definitely less mature. The thing is, even the adults tend to be quite young as well, usually between eighteen and twenty-two. If they lived in the United States, they’d be college age. This often surprises me when I look at the official statistics. In addition, when heights and weights are mentioned, all the women are apparently really skinny. Most of the male characters are quite young as well, but there are exceptions: Cyan is fifty, Tellah and Strago sixty, and Fusoya millions of years old. Terra and Celes are both said to be eighteen, even though the latter is a general. The Final Fantasy Wiki proposes that Celes might have been partially inspired by Joan of Arc, who was also a military commander at a young age. Terra and Celes are both magicians, which is a bigger deal in the FF6 world than in those of other games. 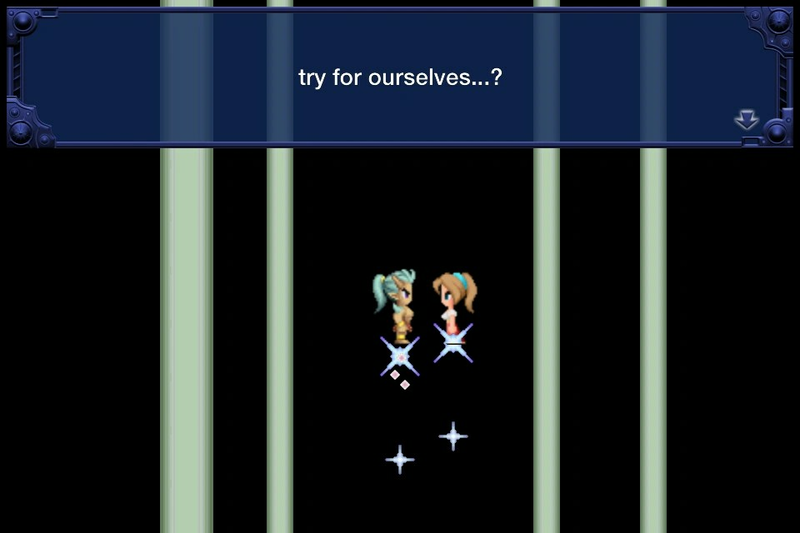 Terra has her powers because her father is an Esper, while Celes was augmented with hers by the Empire. In terms of offensive magic, Terra specializes in fire, and Celes in ice. At the beginning of the game, Terra has amnesia, and only after the battle in the mines of Narshe does she recall her unusual heritage. It turns out that her parents were the Esper Maduin and the human Madeline (called Madonna in the original Super Nintendo translation, although I was never sure whether that was supposed to be her name or just a description). When Emperor Gestahl invaded the Espers’ village and Madeline died, he took the baby Terra back with him. We know little of her upbringing, but it’s likely that she was basically treated as a lab rat. Under the control of Kefka’s slave crown, she commits various atrocities in the name of the Empire. Since mind control is necessary to achieve these effects, she’s presumably not violent on her own, despite having been brought up around would-be world conquerors. After finding out about her past, she is able to take a more powerful Esper form during battle. A major struggle for her is that she’s concerned she’s incapable of feeling love, but this turns out to be untrue when she begins caring for the orphaned children of Mobliz. Her friends are worried that she’ll die when magic and Espers disappear from the world, but she’s able to hold onto life due to her attachments. Celes is presumably an orphan, but since Cid of the Magitek Research Facility is a surrogate grandfather to her, she apparently knew more of familial affection than Terra ever did. Still, she’s fairly proud and independent. She was one of the earliest experimental Magitek Knights, given power from Espers when she was a child. As a general, she led some brutal attacks, but eventually turned against the Empire. For this, she was jailed in South Figaro. Locke Cole rescues her and develops feelings for her, and she becomes a valuable member of the Returners. During the course of the game, she has to take the place of an opera singer who looks like her. 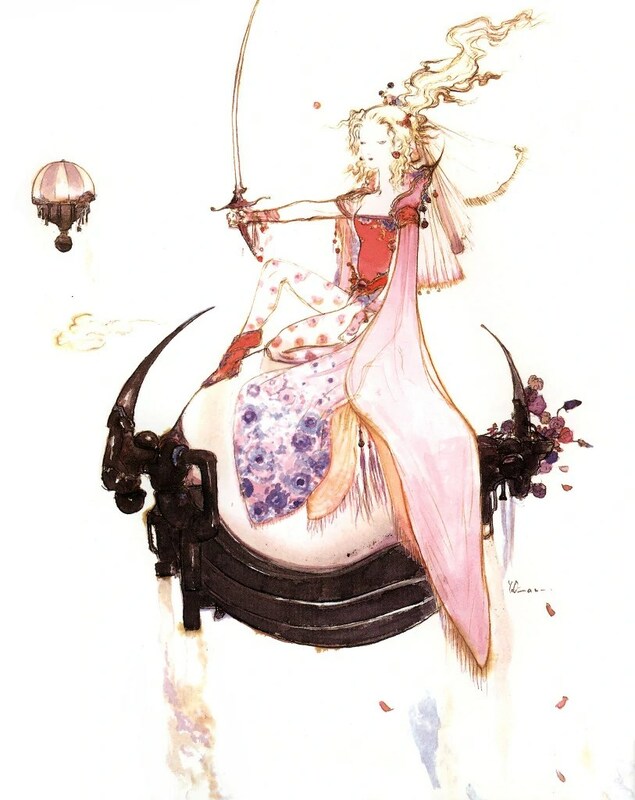 After Kefka destroys much of the world, she spends a year on a desert island with Cid, but finally uses a raft to reach the mainland and reunite her allies. Many of the FF women are presented as either love interests or motherly figures, if not both. They also tend to be healers, and not all that skilled with weapons. There are exceptions, however, like the purposely un-feminine Faris. While neither Terra nor Celes is a physical powerhouse, they’re both former imperial soldiers. For all of the terrible things you can say about Gestahl, he apparently never had any objection to women in the military. Terra is a motherly sort, particularly fond of children and animals, although at first she thinks she might not be able to love at all. Celes is a love interest, but that’s hardly the extent of her character. They do both seem really interested in clothes shopping when preparing for Gau’s reunion with his father, but then so do some of the guys. Celes is said to have a passion for gardening, although I don’t know that this is considered especially feminine in Japan. It’s been speculated that Terra and Celes’ names are meant to parallel each other, with the former referring to the terrestrial and the latter the celestial. The only problem is that Terra’s name was originally Tina, but the English translator changed it because he considered Tina to be too common. So the connection might be intentional, but only in English. It is perhaps noteworthy that Aerith in the next installment has a name that’s supposed to sound like “Earth.” It’s also possible that Celes was named after the grain goddess Ceres, but I don’t think there’s ever been an official answer. I’m not even really sure how it’s supposed to be pronounced, although I’ve always said it like “sea-less.” The ending of the game reveals all of the characters’ last names (well, except for Gau, Mog, Umaro, and Shadow), and I initially thought Branford sounded rather too bland for Terra. Looking at its meaning on the Final Fantasy Wiki, it’s apparently derived from Welsh. Her father’s name, Maduin, comes from the Irish Mael Duin, so maybe there’s supposed to be a Celtic connection there. The Espers’ village being accessible only through a hidden cave fits with the Celtic Sidhe and their fairy mounds, and Terra could probably pass for one herself. The fact that nobody uses the last names in the game itself apparently means imperial military officers are called by their first names, which is also true of General Leo Christophe and Kefka Palazzo. I don’t even know where Terra and Celes received their surnames. Was Madeline’s last name Branford? I remember seeing it suggested that Cid’s last name was Chere, but his full name was later revealed to be Cid del Norte Marquez. 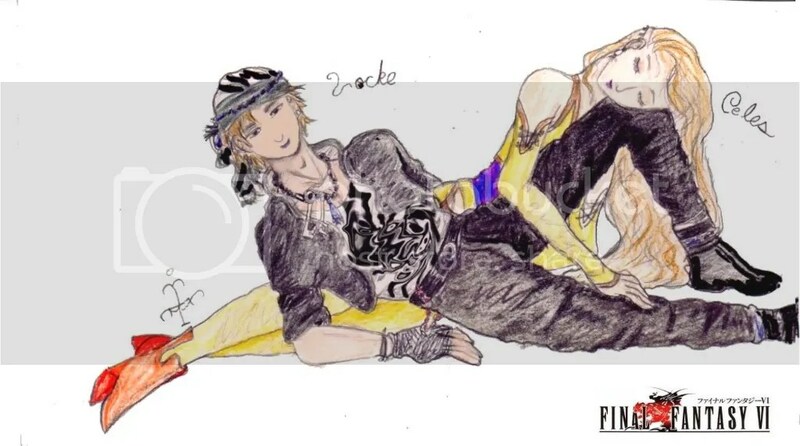 If Celes marries Locke, I wonder if she’ll become Celes Cole. This entry was posted in Celtic, Final Fantasy, Gender, Greek Mythology, Magic, Mythology, Video Games and tagged aerith gainsborough, bartz klauser, cecil harvey, celes chere, ceres, cid del norte marquez, cloud strife, cyan garamonde, emperor gestahl, espers, faris scherwiz, final fantasy iv, final fantasy v, final fantasy vi, final fantasy vii, gau, general leo christophe, joan of arc, kefka palazzo, krile mayer baldesion, lenna charlotte tycoon, madeline, maduin, mael duin, magitek, mobliz, narshe, porom, relm arrowny, rosa joanna farrell, rydia of mist, strago magus, tellah, terra branford, tifa lockhart, yuffie kisaragi. Bookmark the permalink.